John Ridd (John Sommerville) was just a boy when his father, a good and honest man, was brutally murdered by Carver Doone (John Turner). Despite an outward display of respectability, the wealthy Doone family delight in creating havoc and mischief. As John grows up, he vows to avenge his father’s death. But matters are complicated when he falls deeply in love with the young Lorna Doone (Emily Richard) whose hand in marriage has been promised to her cousin, Carver …. Subtitled A Romance of Exmoor, Lorna Doone by R.D. Blackmore was originally published in 1869. An instant success, it has spawned numerous television and film adaptations over the last hundred years or more. It’s easy to see why, since it’s a heady mixture of action, adventure, revenge and romance. This 1976 BBC Classic Serial version is a faithful adaptation (always a hallmark of the Classic Serials) although it does take a short time to tune in to the style of production. Even for those well used to the delights of archive television, some of the 1970’s Classic Serials initially appear to be rather earnest and mannered (the numerous very fake-looking beards are also a hindrance). But it doesn’t take long before the story starts to engross and the small niggles fade away. Richard Beaumont, as the young John, carries most of the first episode. Although still a teenager, he’d already enjoyed a decent career stretching back to the late 1960’s (including a brief recording contract with Decca records). His John is a pleasing mixture of youthful impatience and innocence and such is the impression he makes that it’s almost a shame when John suddenly turns into the much older John Sommerville. It’s slightly odd that none of the other characters seem to age though (which makes John’s transformation from scrawny youth to strapping young man all the more jarring). Possibly it would have been better to have staged this transformation at the start of the second episode, rather than at the end of the first. Episode one also gives us a brief glimpse of the young Lorna, played by Jennifer Thanisch (best known for appearing as Anne in the Southern series of The Famous Five). John Somerville’s John Ridd is a stolid enough creation but it’s Emily Richard’s Lorna Doone who really catches the eye. Easily the more experienced actor of the two, Richard had just starred in The Glittering Prizes and would later appear in the well-remembered WW2 drama Enemy At The Door. Plenty of familiar faces are on show. Patrick Troughton plays Councillor Doone, not a terribly large role but Troughton was always good value whatever part he played. Ian Hogg is very appealing as the roguish highwayman Tom Faggus whilst Lucinda Gane (later to play Miss Mooney in Grange Hill) appears as Lizzie, one of John’s sisters. David Garfield, Max Faulkner and Trevor Baxter are amongst those who contribute to a strong supporting cast. The romance between John and Lorna is a key part of the narrative, with various other subplots – the infighting amongst the Doones, rumbles of unrest in London about the King ‘s conduct – also bubbling away nicely throughout the episodes. Whilst it’s true that some of the rustic supporting characters err on the ripe side, Lorna Donne boasts some fine performances amongst the principals. If you love the 1970’s era of the BBC Classic Serials then this should certainly appeal. 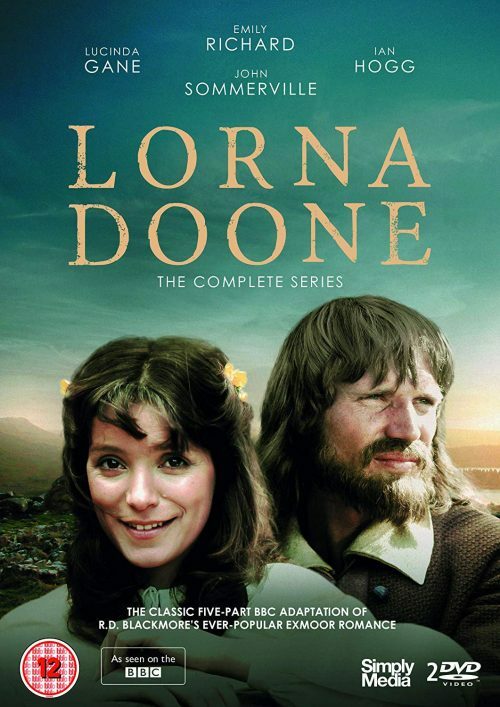 Lorna Doone is available now from Simply Media, RRP £24.99. It can be ordered directly from Simply here (quoting ARCHIVE10 will apply a 10% discount). Tommy Abbott (Ian Hogg) has broken out of prison and returns home to a less than warm welcome from his wife Sal (Diana Bishop). John Watt is concerned to learn that Abbott’s on the loose. Reports have reached him that Abbott could be developing schizoid tendencies, which might make him a danger either to himself or others …. When Abbott first appears he has two fellow escapees, Michaelson (Louis Mahoney) and Jewkes (John Garrie), with him. Let’s be kind and say that their performances are on the broad side – especially Mahoney – but things pick up when Abbott is left alone with his wife. This was a fairly early credit for Hogg, probably best known for the eighties police series, Rockliffe’s Babies (which is long, long overdue for a DVD release). Abbott may be the focus of the Task Force’s attention, but until the last fifteen minutes or so he doesn’t have a great deal of screentime. He winds up at the chemical plant where he used to work. Sal is convinced that he plans to kill himself and also hints that she was raped by him earlier (which might confirm Watt’s theory about Abbott’s devolving personality). Barlow, never the most tactful of people, labels Abbott as a nutter and doesn’t seem at all concerned to learn that he might be contemplating suicide. Other programmes might have discussed whether the penal system had created Abbott’s problems, but SS:TF only lightly skirts around this issue. A psychologist is brought in, but he contributes little of value. There is a grudging comment that if Abbott is captured then he’ll receive treatment (had he stayed locked up, the inference is that he wouldn’t) but that’s as far as the debate goes. We see several examples of Watt’s protective (or sexist, depending on your point of view) treatment of WDC Donald. It’s slightly eye-opening but no doubt reflected the attitudes of the time. PC Snow and his new police-dog Radar (who replaced Inky, shot down in the line of duty in the final episode of series one) believe they’ve located Abbott, but if he’s inside the chemical plant then they’ll have to tread very carefully (Abbott is carrying a box of matches and one spark could cause an inferno). Baptism is a static, talky episode but things pick up towards the end when Abbott makes his reappearance and we see Barlow entertain himself by browbeating Michaelson. Mahoney has some decent material to work with here and the battle of wits between Barlow and Michaelson is a good one.